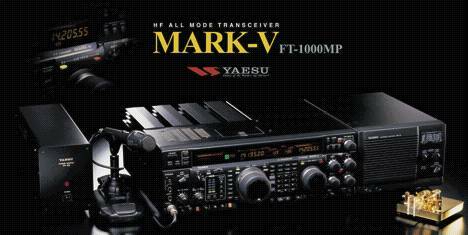 The MARK-V FT-1000MP represents the crowning achievement in Yaesu's HF transceiver design history. A unique blend of analog and digital technology, the MARK-V is based on the concept of rigorous filtering in all stages of the receiver and transceiver. which matches the receiver passbands of the 8.2 MHz IF, 455 kHz IF and DSP systems. providing a high-Q "Preselector" system protecting the receiver's front end. providing extraordinary SSB signal purity. giving you the extra drive for your linear. control of Yaesu's exclusive Shuttle Jog. With high power output, superb ergonomics and Yaesu's unique know-how in designing elite-class HF equipment, the MARK-V FT-1000MP will be utilized by DX and contest champions for years to come. Introduced at the Dayton 2000 Hamvention, the new Yaesu Mark V/FT-1000MP transceiver is squarely aimed at the high performance contest and DX crowd. Combining the best of the venerable FT-1000D with the DSP and computer glitz of the mid-priced FT-1000MP, the Mark V is Yaesu's attempt to dominate the "elite class" market for the next decade. After swearing that I would never get rid of my beloved FT-1000D, I finally succumbed to temptation and shelled out $3269 for the basic Mark V and another $305 for two optional filters. There's still room for four more filters; however, to "load" the radio fully with filters would cost an additional $600! Here are some first impressions. What first catches your eye about the new Mark V is the top heatsink, which is an integral part of the cabinet. 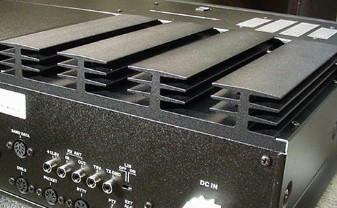 Yaesu claims the heatsink has 250% greater cooling power than the rear-mounted heatsink on the FT-1000D. 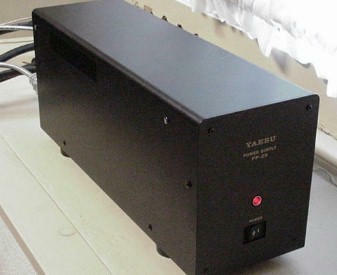 Like the FT-1000D, the Mark V runs 200 watts output. Whereas the FT-1000D used bipolar power transistors, the Mark V uses a pair of Phillips BLF147 power MOSFETS. A special "Class A" mode reduces power output to 75 watts, and is claimed to reduce IMD (distortion) to lower than -50db, which would best any ham transceiver ever made. There's good news and bad news about the FP-29 external switching power supply The good news is that the FP-29, which provides 30V @15A and 13.8V@3A is included at no additional charge. The bad news is that the FP-29 has an irritating bottom-mounted fan (see below) which runs all the time. Though much quieter than the fan on Icom switchers, it's still audible in a quiet room. On the plus side, Yaesu provides a 2 meter long interconnecting cable, so the supply can be hidden behind the desk. The unusual top-mounted heatsink (right) is cooled by a novel "paddle-wheel" internal fan (below). The fan is thermostatically controlled and doesn't run all the time. Plan on spending nearly $900 if you want to load up your Mark V with optional filters. The main receiver takes up to five optional filters for the 2nd and 3rd IF, and the sub-receiver holds one optional filter. The Mark V uses a combination of crystal and (Collins) mechanical filters. The three filters at the bottom of the photo are supplied (the blue one is a Collins 10 pole SSB filter --the FT1000MP uses an 8-pole filter. ), while a 250 Hz optional filter is at the upper right. A nice new feature: the bandwidth of the DSP filtering is automatically interlocked to the bandwidth of the selected analog filters, even when using the "width" vernier. Out of the Box: My first challenge with the radio was installing two plug-in optional filters. I couldn't figure out how to take the cabinet off! The instructions in the manual were wrong (probably not updated from the FT-1000MP). In short, the cabinet is in four pieces, with 23 screws of three different types. Although it was easy to plug in the filters once I got the cabinet apart, it was then a challenge putting everything back together. Two tiny screws recess into the narrow space between the heatsink fins; nursing them back into their holes required a bright light and pair of curved tweezers. My advice: ask the dealer to install the filters for you. 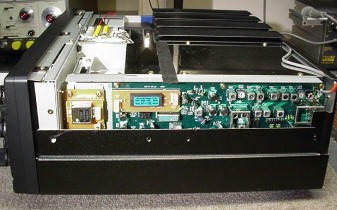 The blue Collins 500 Hz sub-receiver filter is shown in the below photo, to the right of the TCXO oscillator module. Initializing the software for the selected filters was also confusing. More about this problem, below. How's the Quality? I was generally pleased with the radio's workmanship. Although not mil-spec construction, it seems nicely engineered and layed out. 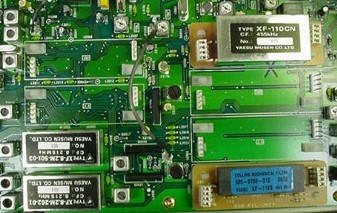 Circuit boards use a combination of surface-mount and through-hole components. The top-firing internal speaker is larger than normal (3.5 in.) and sounds very good. Curiously, the thin little AC line cord (left) seems underrated for a rig that draws nearly 500 watts. I also didn't care for the cheezy interconnecting cable between the FP-29 and the radio. It uses molex-type connectors on each end of individual wires (a black sleeve holds the bundle together), with no strain-relief on the wires. Seems like for nearly four grand, you would get a nice cable with molded connectors. How about new features? Look closely at the right photo and you'll see "VRF" and "IDBT" on each side of the tuning knob, underneath the TX and RX LEDs. The VRF "Variable RF" button activates a manually-tuned front-end preselector, which one tweaks for maximum signal, just like us old-timers used to do on radios from previous eras. I guess the more things change, the more they stay the same. IDBT stands for "interlocked digital bandwidth tracking system," which sets the radio's DSP bandwidth to that used by the cascaded crystal and mechanical filters. What's neat about this feature is that it automatically corrects for adjustments in the IF shift and IF width controls. The feature can be toggled on or off by a button to the right of the tuning knob. Rough Edges: The Mark V isn't without blemishes, many attributed to its being brand new on the market. Some of these result from Operating Manual errors (such as the cabinet removal instructions, noted above), some from inappropriate default menu settings, and a few from quirky design choices. Although frustrating, none of these in my opinion are deal-breakers. I spent considerable time figuring out the filter selection options. Some menu names are unclear and occasionally wrong. For example, "OFF" in the SSB normal filter menu (5-0) means that the 2.4 kHz SSB filters are both ON, and the manual misidentified filter menu (5-2) as "CW normal filter," whereas it was really "CW Narrow 2." The manual incorrectly labels the choices of menu items 7-7 (EDSP Enhanced Modulation and Demodulation). This menu item turns on or off the DSP filtering for several modes. Also, the default setting for CW reception was ON and this choice caused me considerable grief until I changed it. The default setting evidently sets the 4th IF DSP bandwidth for "normal" CW reception to 2.0 kHz. This is fine if the optional 2.0 kHz filters are installed, but if they aren't then the DSP bandwidth doesn't match the bandwidth of the supplied 2.4 kHz filters. This mismatch means that strong CW signals outside the 2.0 kHz DSP bandwidth can capture the AGC, wiping out the weak signal you're trying to listen to. Deactivating the DSP for this mode solved the problem, but until I figured out the solution, I was almost ready to ask for my money back. The only electrical bug I noted was in using the built-in tuner. The tuner didn't seem to handle high SWRs as well as my FT-1000D, and once or twice it locked the radio into the transmit mode, requiring me to kill the AC power. Once the tuner managed to get itself adjusted, then things worked fine. I'll keep my eye on this problem and report further difficulties. On-the-Air at Last! To get a feel for the new rig, I tried it side-by-side (see photo below) with an Icom IC-756PRO and a 15-year-old Signal/One Milspec 1030. First, let me dispell any notions you might have that radios were better in the "good old days." The top-of-the-line Signal/One just didn't cut it, receiver-wise. Compared to either the Yaesu or Icom, the Signal/One sounded noisier on the bands, the noise blanker didn't measure up to the others, the selectivity wasn't as good, and it sure wasn't as convenient to use. However, in the Signal/One's defense, people liked its rf-processed transmit audio better than the processed audio on the other rigs. How does the Mark V stack up with IC-756PRO? Keep in mind that I wasn't pushing the radios to their limits, as one might do in a pileup on 160m CW or a multi-multi contest operation. These are impressions, not detailed technical comparisons. So with that caveat, I'll first state the obvious. . . In terms of overall features the IC-756PRO wins out handily over the Mark V. With 6 meter coverage, lovely color display, bandscope, wide choice of filter bandwidths, and umpty-up menus, the Icom has nearly every bell and whistle imaginable. It also costs about a kilobuck less than a loaded Mark V. It's obviously a great value. But features don't tell the whole story! Although the Mark V doesn't do as much as the 756PRO, what it does, it does brilliantly. For instance, I checked the s-meter sensitivity on 160m, 20m, and 10m on both radios with my HP-8640 signal generator. An S-9 signal is supposed to be 50 uV. However, S-9 on the Icom wandered between 72uV and 96uV on the three bands (no preamp). An S-9 on the Mark V (no preamp) was exactly 50uV on all three bands -- a minor accomplishment, admittedly, but a sign that the designers paid close attention to detail. In A-B comparisons, the audio on the Mark V always sounded better -- crisper, and without any of the tell-tale hollowness of DSP processing. CW signals on the Icom sounded a bit mushy. The Mark V was also a clear winner in selectivity tests. In fact, I've never before heard a receiver that seemed almost to have no "skirts" on its filters. CW signals just vanished abruptly when they toppled over the filter's edge, leaving behind only a few key clicks. The Yaesu's combination of crystal filtering at the 2nd and 3rd IFs, and DSP filtering at the 4th IF certainly seems to work. You're paying top dollars for all that selectivity, but the results are remarkable. In these tests, I noted that the DSP-based Icom filters seemed to have broader skirts on the wider bandwidths. In one strong-signal test, I injected a 100,000 uV signal into both radios at 28.600 MHz and looked at the rolloff of their 2.4 kHz filters. This kind of test introduces a large amount of "hash" near the signal frequency. On the Yaesu, the signal dropped from full strength (about S9+60db) into this backgraund hash in about 200 Hz. On the Icom, it took nearly 700 Hz for the signal to drop into the hash. I then tuned the receiver to 28.500 MHz, 100kHz away from the 100,000 uV signal. When I switched the signal on and off, I could hear just a barely perceptible increase in the background noise on the Yaesu. In contrast, the hash in the Icom jumped 20 db above its noise floor when the signal switched on. In essence, the huge signal 100 kHz away didn't cause the Yaesu to bat an eye, but it would have completely obliterated any weak signals on the Icom. I preferred the tuning of the Mark V over the Icom. The large main tuning knob is a joy. (It's larger than the knob on the FT-1000MP; in fact, it's the same diameter as the tuning knob on the Collins 75A4.) The knob is significantly larger than the 756PRO's knob, and it turns with a velvety feel that is outstanding. 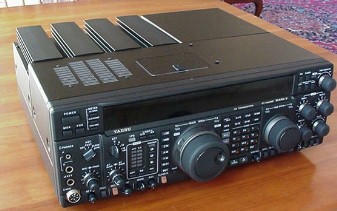 The Yaesu's sub-receiver is also better than Icom's. It's truly a separate dual-conversion receiver, with its own filters and tuning knob. The noise blankers and DSP noise filters worked equally well on both radios. If I had to sum up the two radios, I'd say that the IC-756PRO is a Cadillac and the Mark V/FT1000MP is a Porsche. They're both fine rigs, but intended for different drivers. For just crusin' around the bands or hanging out with the gang on 3865 kHz, the Icom would do just fine. It's not only a pleasure to use, but lots of fun. 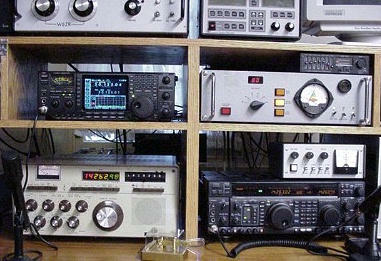 However, for full-bore competition in the CQ World-Wide DX Contest, or digging weak signals out of a pileup, I'd take the Yaesu in a heartbeat. The bottom line: We won't know for sure until QST checks out the dynamic range and 3rd order IP, but my first impressions suggest this radio will set a new standard for strong-signal performance. With filters galore (crystal, mechanical, audio, and DSP) and tuned preselectors, the Mark V ought to be the radio to beat for contesting and top-band dxing. Feature-wise, it's comparable to many other modern transceivers. The controls are intuitive and straightforward, and the DSP, NB, NR, etc., work well. (I do wish there was more flexibility in the AGC choices; it would be nice to have the time constants selectable by menu.) However, Yaesu is clearly not banking on glitz to sell this radio. The Mark V will sink or swim on the basis of its core receiver performance. If it truly is as crunch-proof as claimed, then I predict the "big gun" power users will jump on this radio as eagerly as they did on the FT-1000D, nearly ten years ago.